The battle of the minds on Singapore's early Independence history is heating up. After Dr. Thum Ping Tjin's recent assertion that Operation Coldstore represented a blatantly political exercise by the PAP to destroy the legitimate ‘progressive left wing’ opposition in Singapore, another academic Associate Professor Kumar Ramakrishna has come out questioning Thum's position and research on the issue. This crossing of swords between Singapore's intelligentsia is exciting to say the least and will help in the recovery of Singapore's historical amnesia. The recent controversy over the Indonesian navy’s decision to name a vessel after two marines that had bombed MacDonald House in Singapore on 10 March 1965 is revealing. It has reinforced philosopher George Santayana’s quip that those who cannot remember the past will be condemned to repeat it. The action by the two bombers, Osman Mohamed Ali and Harun Said, killed three Singaporeans and injured 33 others, and was part of the low-intensity war known to posterity as Confrontation. This campaign was waged by the left-leaning Indonesian President Sukarno against what he regarded as a British ‘neo-colonial’ challenge to his designs for regional supremacy: the newly inaugurated Federation of Malaysia, which at the time included Singapore. Particularly telling was how much effort the media and several ministers had to invest to enlighten Singaporeans as to why the Indonesian decision was injurious to Singapore’s national dignity. Such collective historical amnesia is not exactly healthy as it renders the body politic vulnerable to distorted versions of defining episodes in our history. Case in point is another historical episode from the tumultuous 1960s that has received rather sensationalistic treatment recently: the internal security action called Operation Coldstore on 2 February 1963, two years before the MacDonald House bombing. 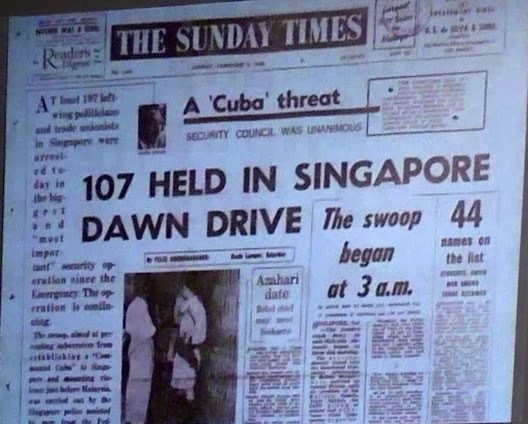 History records that Coldstore was mounted to contain the threat to Singapore’s security posed by the Communist United Front then dominating key interest groups. Now Ping Tjin Thum (P.J. Thum), a young Singaporean historian, disputes this. He argues instead that Coldstore represented a blatantly political exercise to destroy the legitimate ‘progressive left wing’ opposition that had hitherto offered the only credible electoral challenge to Lee Kuan Yew’s People’s Action Party (PAP). This is a good story. But reality was not that straightforward. By the late 1950s, in the midst of the Cold War and post-war decolonization, the British Colonial Office sought to transfer power to local governments in Kuala Lumpur and Singapore that would be anti-Communist and friendly to Western geostrategic interests. British Commonwealth forces were meanwhile engaged in a shooting war with the Communist Party of Malaya (CPM) in the jungles of that country. South of the Causeway a strong Communist United Front (CUF) had penetrated the Chinese-educated workers’ and students’ associations, as well as the left-wing political party, the PAP, that seemed most likely to win the election for limited self-government in 1959. The British feared that the CUF would ultimately overwhelm the English-educated PAP leadership led by Lee, turning Singapore into a Communist-dominated ‘second Cuba’ in the heart of maritime Southeast Asia. The Colonial Office in London and Lee hence sought to persuade the politically conservative Malayan Prime Minister Tunku Abdul Rahman to overcome his fear of upsetting Malay political dominance and power in Malaya with the absorption of Singapore Chinese. To resolve the racial equation, they proposed that the island be absorbed into an expanded Malay Federation that would include the British Borneo territories as well. The geopolitical calculus was that with control of Singapore’s internal security vested in a staunchly anti-Communist central government in Kuala Lumpur the CPM would be severely curtailed. Hence Singapore would develop within the Federation framework in the desired pro-Western, anti-Communist direction. Because Tunku insisted that Merger with Singapore required its Communists to be first brought to heel, Coldstore was mounted in February 1963. Eight months later, in September, Singapore achieved full independence from the United Kingdom as part of the Federation of Malaysia. Thum now appears to question this standard security-driven narrative of Coldstore. His ‘revisionist’ interpretation focuses on PAP leader Lee’s supposed obsession with power and determination to destroy his closest political rival, the charismatic Chinese-speaking ‘progressive leftist’ Lim Chin Siong and his colleagues in the PAP, the unions and other interest associations. By late 1962 the supremely crafty Lee had apparently manipulated the British and Tunku into a corner. In particular, Lord Selkirk, the UK Commissioner in Singapore, expressed misgivings that the list of individuals that Lee wanted detained seemed to be targeted simply for being in political opposition. Lim Chin Siong especially seemed to be fingered not because of security reasons but because Lee wanted him arrested so that the PAP would win the upcoming general elections. Because the political clock was ticking away, Tunku warned the British in January 1963 that if the Chinese-educated political left in Singapore were not locked away, Merger would be off. An anxious Colonial Secretary Duncan Sandys in London thus overruled the objections of Selkirk and Coldstore went ahead. Politics had trumped security. There are two main problems with Thum’s argument. First, he argues – citing Selkirk’s contemporaneous concerns - that at the time of Coldstore there was no direct evidence that Lim Chin Siong and other detainees were engaged in actual Communist subversion. But the records do show that even careful British officials conceded that Lim was a skilful CUF operative and other detainees possessed a recent history of subversive activities. Tunku also agreed that the detentions on preventive grounds were necessary. This was prudent. CPM elements within the utterly penetrated Barisan Socialis that was challenging the PAP for power never ruled out switching strategy to armed violence at any time. Historian T.N. Harper hence considers Selkirk’s attempted distinction between ‘political’ and ‘security’ grounds for detention as ‘problematic’. Second, Thum emphasizes how Tunku and Selkirk disliked Lee’s personality and byzantine political machinations. But CUF leaders – said to possess ‘animal cunning’ themselves – in fact regarded the tactically agile Lee as the only serious obstacle to their plans to establish Communist rule in Singapore. British envoy in Kuala Lumpur Geofroy Tory sympathized with Lee’s position, warning that playing by ‘Queensbury rules’ with the unscrupulous Communists would be folly. Ultimately, cautious British officials in Singapore conceded that in view of what historian S. J. Ball called the ‘ruthless, fast-moving and mendacious’ nature of local politics at the time, Lee Kuan Yew, warts and all, was ‘the only man who can run this city’. Singapore celebrates its 50th national birthday next year and the nation seems to be in ‘mid-life crisis’, grappling with issues like immigration, national identity and political change. In this light, the appearance of revisionist historical accounts – aided and abetted by the historical amnesia Santayana warned about - is unsurprising. Nevertheless, perhaps one positive step to begin salving the national mood is more extensive, innovative and creative public education efforts to promote a greater appreciation for and knowledge of our history. As part of this process, Operation Coldstore itself must be seen in context – it occurred during a difficult episode in our history amidst a genuinely dangerous period in the Cold War, as evidenced by the Cuban Missile crisis in October 1962, ongoing advances made by communists in Indochina, the Brunei revolt in December 1962, and of course the Indonesian Konfrontasi from January 1963. The revisionist view that Coldstore was utterly driven by Lee’s obsession with political power is hence misleading. A more nuanced analysis suggests that reality at the time was defined by morally complex shades of grey. Ultimately, following Machiavelli, the moral test of tough policy choices must be whether they benefit a nation in the long run. Fifty-one years on, even critics concede that Singapore has blossomed into a cosmopolitan, politically stable and economically vibrant metropolis. History would therefore - on balance – very likely adjudge that Coldstore passed this test. Kumar Ramakrishna is Associate Professor and Head of the Centre of Excellence for National Security at the S. Rajaratnam School of International Studies in Nanyang Technological University. A historian by background, he has published extensively on the struggle against post-war Malayan Communism. He is working on a longer scholarly analysis of Operation Coldstore. Just as with any choices we make in life, just cos you chose option A and it turned out well, does NOT mean option B would've been worse or a bad option. We will never know. Somehow I’m more persuaded by Dr Thum than K Ramakrishma. The end doesn’t always justify the means.